Firstchoice Windows have an excellent attitude to customer service and pride themselves on the high levels of quality workmanship they offer. They will firstly establish your exact needs and then give you advice and guidance on the best way to achieve them. 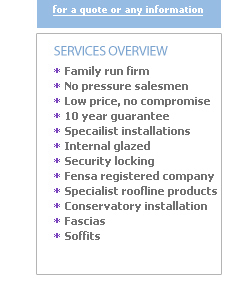 During a visit from Firstchoice Windows there will be no pressure sales, you will simply be presented with a solution and given a quotation. You may then decide in your own time what course of action to take. Firstchoice Windows do not need to use pressure tactics, the quality of their products, manufactured in Rehau and Spectus, are widely respected with in the industry. With high levels of workmanship, their reputation ensures that they always have a constant supply of new customers.